← Lilly Pulitzer Animal Crackers? 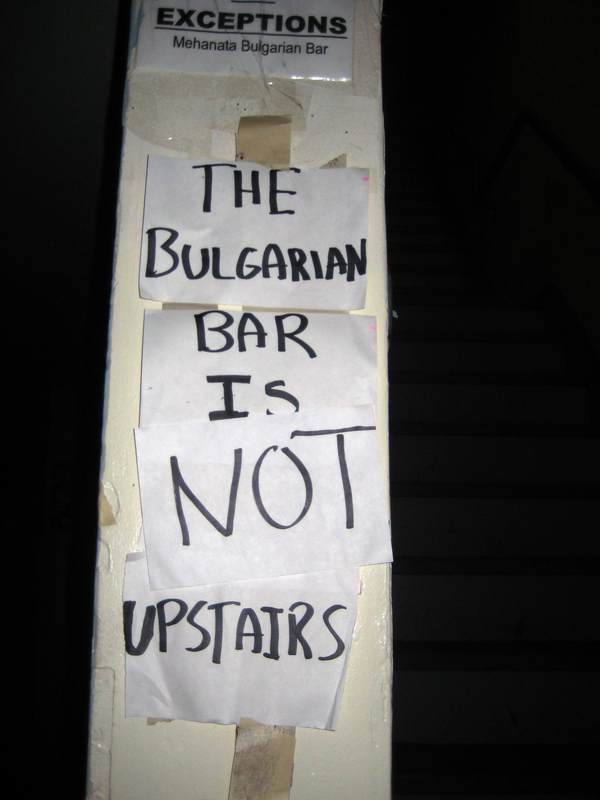 The Bulgarian Bar is NOT upstairs. I, for one, was quite relieved by this signage. Apparently they have a problem with thirsty Bulgarians. Great food, great service, reasonable prices and lovely bathroom with lots of candles. And SO not a Bulgarian Bar. Haven’t had enough of me yet? You can also read me at 50-Something Moms Blog. For photo enthusiasts, visitLeaving the zip code, photos from outside the comfort zone. So that’s where you guys ended up. Happy Birthday Ronnie. No stories from last night for the blog???? Not to be confused with the Vulgarian Bar, huh?